When you have homeowners insurance, you have bought peace of mind that if anything should happen to your home, the repairs will be covered. But when you are dealing with water damage, certain damages will not be covered. The best way to fully understand what your insurance covers is to call your insurance provider. Your provider will be able to entirely walk you through all of the ins and outs of your coverage. You can also make changes to your coverage if you are unsatisfied with coverage. But for most homeowners, there is a particular type of flooding and water damage that is covered. Most insurance policies will cover accidental or sudden water damage but will not cover gradual damage. Gradual damage is when there is damage that takes place to your house slowly over time. Because a house is a complicated thing and there are many working parts, there may be instances where there is damage that is gradually taking effect in your home, and you may not even be aware of it. Some cases of these types of instances that may not be covered are when there are plumbing leaks that have caused damage to floors, walls or ceilings over time, lack of repairs done to the home or water damage caused by water seeping in from cracks in the foundation. 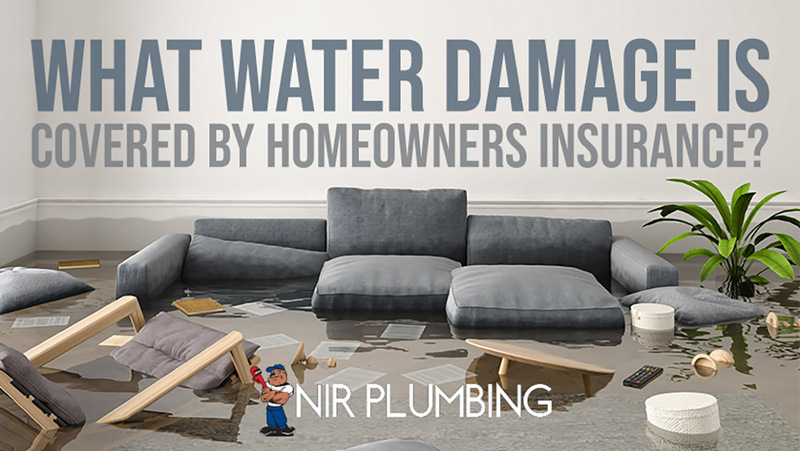 If you have had water damage in your home and your insurance company does not cover the damages you have every right to ask questions so that you fully understand. But before you find yourself in this place, please call us at NIR Plumbing. We can help fix your leaks before there is any severe damage to your home, so you do not have to worry about claiming any damage on your homeowner’s insurance.